Jay Bennett is a freelance tech writer and digital marketing consultant with 8 years' experience. His writing has appeared on the VisiHow website. Opening Rar files on your Android device is something you'll end up doing at some point or another, especially if you download files from the internet. This is why having a reliable Rar file opener for Android is critical for any level of file management. Here are 6 of the best Rar file extractors for Android devices. The information below should apply no matter who made your Android phone: Samsung, Google, Huawei, Xiaomi, etc. ZArchiver by ZDevs is a powerful archiving tool that comes with a simple-to-follow user interface, fit for all levels of users. ZArchiver can decompress Rar, 7z, zip, rar5, iso, tar, XZ, and many more file types. The app can also create a healthy variety of archive files, such as 7z, zip, bzip2, tar, and gz. ZArchiver is free to download. All features are available with no ads. 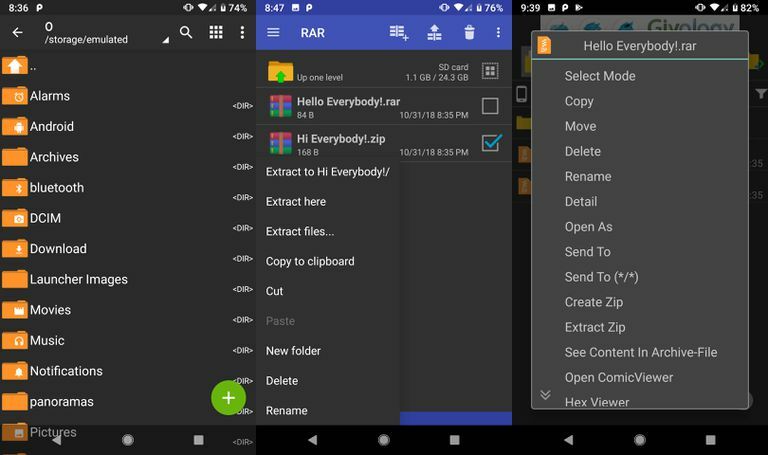 RAR by RARLAB for Android is a fully functional compression app that can create rar and zip files quickly. RAR can also extract a vast variety of file types, such as 7z, gz, zip, rar, tar, bz2, and more. The app also comes with a repair command that can fix damaged archive files. RAR is free to download but does display ads. You can remove the ads for $0.99. Uses multi-cores for faster packing and unpacking. Can occasionally freeze on older versions of Android. ES File Explorer is an all-encompassing file manager that supports both file compression and extraction. The app can compress and extract zip files, extract rar files, and create encrypted zips. With desktop-like features, ES File Explorer provides a lot of options for a mobile device. ES File Explorer File Manager has a free, limited version that can be upgraded for $0.99 to $4.99, depending on the term. The app supports Android 4.0 and up. Archiving features work with the free version. ALZip for Android handles both archiving and file management. The app can extract a wide range of files, like zip, rar, 7z, alz, tar, egg, and more. ALZip can also compress files and folders into zip, alz, and egg files. ALZip is free to download and use, with no ads displayed. The app supports Android 4.0 and up. Fast functioning with a simple but powerful user interface. Cannot extract files larger than 2 GB. 7Zipper is another file manager with archive support built in. Although the app doesn't support the rar extension, It can compress zip, 7z, and jar files. 7Zipper can also extract a variety of files; egg, zip, alz, tar to name a few. 7Zipper is free to download but also displays ads. The app supports Android 4.0 and up. Offers a range of useful features. Supports multi-select when browsing files. No option to upgrade and remove ads. Solid Explorer is a feature-rich file management app that can read and extract rar, zip, and tar files, as well as create password-protected zip archives. The file manager offers two view styles and provides detailed stats on your storage. Solid Explorer is free to try for 14 days, and cost $2.99 for the full version. The app supports Android 4.1 and up. Full rar and zip support. The free trial version no longer functions after the 14 days. Are You Using the Best Geocaching App Out There? What's a RAR File and How Do You Open One? What's a 7Z File and How Do You Open One?